On the internet and around me in real life I see a lot of crafty witches. I like to make things too. I’ve made my own runes from willow wood, made my own drum, several brooms, etc. In the past I’ve done a lot like making paper cards, creative journaling, using all kinds of techniques. So… it’s not that I’m not creative or something. There’s a part of the crafty world though that I can’t find my way in, although I’ve tried several times. On Pinterest and Facebook I see lots of beautiful wool work: crocheted and knitted mostly. My mum learned me how to knit when I was little. She was very good at it herself, but I didn’t like it. Still I knitted a scarf and sweater, but then I stopped. Over the years people have tried to teach me how to crochet, because I really would like to do it! Earlier this year I tried again. I practiced for weeks, but it wasn’t a success and… I didn’t like it. So now I decided to give up on knitting and crocheting for good. Through a friend I got to know ‘tvinningsbennen’ also known as lucet. I bought a tool from her and she learned me how to do. It’s a very old technique, already used by the Vikings. It’s easy and I like it a lot! Some people compare it to spool knitting, but the result isn’t a round cord, but a square one. 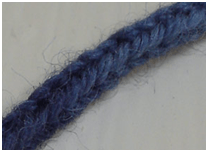 The produced thread is 7 times stronger than the original material. First I made lots of loose cords. Perhaps I’ll make an altar cloth or rug from those. But of course the witch in me wanted to apply this craft for ritual use or make pagan stuff. The first thing I discovered was, that it is very meditative because of the repetitive movements. It helps me focus. I also use it in nature to get in tune with the place. Then I got another idea, a variation on a witches cord or witches ladder. 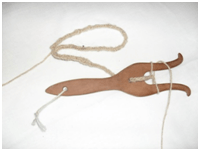 You can make spell cords, moon cords, initiation cords, or sabbat cords, etc. For spell work, protection, decoration even; it’s all up to you! 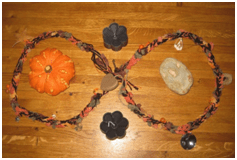 The first one I made was a Samhain cord. I used Samhain colours. While making it I tuned in on my ancestors and put things in it (physical and non-physical). For the Yule cord I used appropriate colours and attached bells at the end. 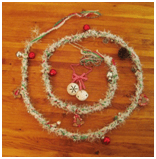 I used the cord to cast the circle for our ritual to welcome back the light in the early Yule morning last year. For Imbolc I wanted to do something different. 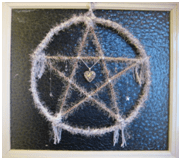 I used the lucet to make a cord around copper wire, bent a circle from it and made a pentagram from twigs in the middle. At the moment I’m working on a rite-of-passage-cord for the daughter of a craft-sister. She is 13 and we are going to do a ritual with her to mark the transformation from girl to young woman and to welcome her in our circle of women. We will all give her something in the ritual and I decided to make a cord for her. I’m using 7 different threads in one: multi-coloured for life itself, black & white for the balance between light and dark, blue & pink for male & female energies, red and very thin silver for the red thread with silver lining. I’ll work little things into it that represent my wishes for her. A key to open (or close) doors, a holey stone for health and strength and other symbols, etc. – a total of 13. While working on it I will think of her life until now and visualize her as a healthy and happy young woman. The length will be her current length.